With U.S. 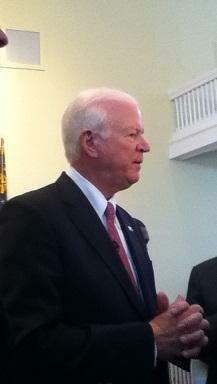 Senator Saxby Chambliss not running for re-election, who will succeed him? Many are considering a run. Although, it’s not likely anyone will get an endorsement from Chambliss. Chambliss Monday offered advice to what he said would be a long list of candidates in the 2014 U.S. Senate race. To hear the story that aired on Morning Edition (1.29.13), click here. While no one has officially thrown their hat in the ring, many Republicans and Democrats reportedly are weighing their options. Chambliss says the winner should be moderate and not extreme. “People who avow to represent nine and a half million people and not just one segment are the ones that I think are gonna get elected in the future,” Chambliss said. Right wing Georgia Republicans have criticized Chambliss for being too bipartisan. The far right planned on making a Chambliss re-election campaign difficult. Chambliss is confident in his fundraising and campaigning ability. But, he says the process of solving fiscal issues in Washington has become too ugly.